The bail out of Greece, whether temporary or not, has definitely improved our workflow. We must be the best barometer going for financial confidence because the reaction as far as job enquiries for Lookalikes is concerned, is immediate. Amazingly! The new enquiries are very biased towards firstly The Queen – both for now and ahead – right up to the June Jubilee weekend which is looking like it will be mayhem at this moment, as far as availability is concerned. We are still hopeful that Jeannette Charles will be well enough to participate and enjoy what should be the ‘swan song’ of her long and ground breaking career as a Lookalike. Her name is the one that people still associate with the Lookalike industry – the first and still the most famous. I really hope that she is not forced to retire now of all years but so its just fingers crossed for the results of various tests which should tell us whether there is anything that can be done medically to improve her mobility. We are all thinking of you Jeannette long may your career continue as that of Her Majesty herself. Thank goodness, of course, we do have Mary Reynolds, Patricia Ford and Margaret Southcoat but these ladies are no longer in the first flush of youth and have to take life and lookalike work at a slower pace which does not fit in with the what looks like a frenzy of the Jubilee weekend. What will be will be. We have been trying to ‘drum up’ some new recruits – alternative possibilities – plus chasing people who we have had on our books for a while but have never worked and searching others on YouTube. But we haven’t been too successful as yet – age comes with many problems i.e a very expensive realistic wardrobe – and ease of transport coming top of theproblem list it seems. If anybody reads this and feels they know somebody who would fit the bill – need not be an actor – please get in touch – now! The rest of the Royals – particularly Kate, are still in demand. As from her 30th Birthday and now that she is undertaking her own appearances, most of the newspapers are keen to write articles about her style and wardrobe – very reminiscent of Princess Diana. We have a new Royal icon – there is no doubt. Good for us. We did a lovely article and shoot with 8 Kates which will come out in the July edition of a very ‘nice’ glossy. The Sun have just this week shot 4 Kates and interviewed them but with a very heavy emphasis on what they can earn as a Kate Lookalike. This is not something that we encourage because fees vary enormously dependent on what is required and we are always open to negotiation. As I see it, being a Lookalike is not about becoming rich but more about the experience and fun. This is not true of us as Lookalike Agents – where it is all about the money because it is a business and we are not here to do things for free. I say that but in fact we do – usually because of the promise of a name check – which then does not appear. 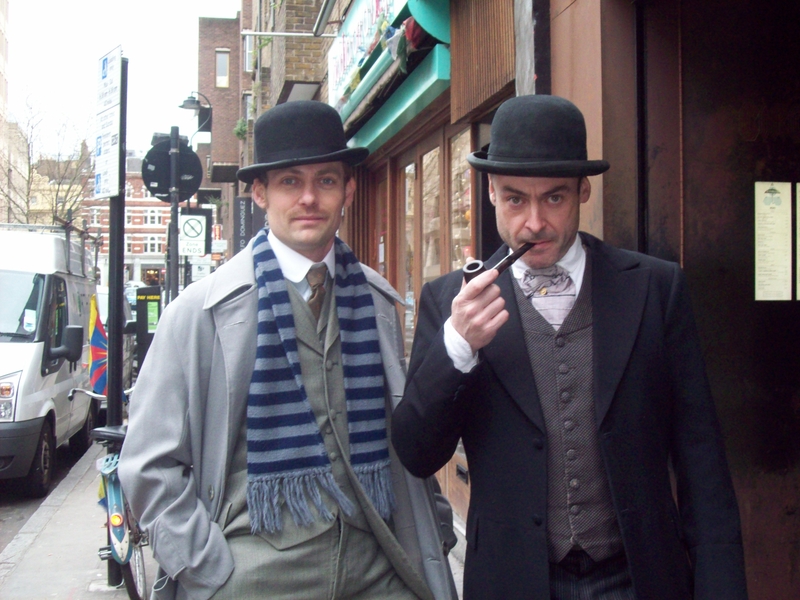 Apart from the Royals we have done some pretty varied work – we did Holmes & Watson a la Guy Richie – James Bonner as Robert Downey Jnr and Scott Parham as Jude Law for a daytime reception at ‘ Circus’ in Endell Street – hard work for us as we had to costume them. Angels were very helpful but as we had to collect and return the costumes as well as delivering them to the venue it hardly makes it worth doing the job – but, of course, we did and got a couple of nice shots of the guys. Lina Sands (Angelina) has continued getting an enormous amount of interest and she did spend 2 days at an exhibition in Paris for us. But her sights are set firmly on becoming an actress in her own right and those jobs are taking precedence over the Lookalike jobs so a bit of a shame for us but good for her. But we shall see as we have managed to get a couple of scripts for her. Mary Reynolds (The Queen) is working steadily and has done a nice PR Company party at Kettners plus an MP’s birthday party in Hampshire on the night of the terrible snowstorm. Don’t know how she drove there and back to Hampshire that night – well done Mary you are a real trooper. Alison Jackson has been up to her usual tricks and did a funny Times Online video of Ed Milliband falling down a manhole in the street. First job for our new Ed. Also for Times online she did Putin’s election day – in her way. All very last minute and time consuming for us. We are lucky in having so many lookalikes on our books but because there are so many we cannot keep up with all their movements – so any last minute job for a little used/new Lookalike is a nightmare and quite often we miss these jobs because it takes us so long to trace the person, the job (usually PR or newspaper stunt – not always Alison Jackson) has been forgotten or the client does not have the patience to wait. One of our main trials! Luckily we did manage to contact our Bruno Mars (Anton de Whalley) for a little part in TOWIE. Our newish Beckham Jamie Gleeson made a nice Pizza Delivery boy for an advertising pitch for Iris, Luke Williams (Harry Potter) worked his magic for a Batmitzva in Whetstone while Paul Buonocore did the same at Alton Towers as Willy Wonka. 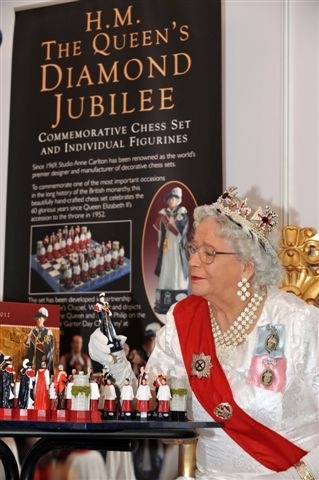 The Queen (Margaret Southcoat) and Prince Philip (Vernon Preston) promoted a new ‘Royal’ Chess Set at the Toy Fair at Olympia while Ghandi (Ramakant Shah) went to Paris for the very prestigious photographer Rancinan. Terry Nelson as Richard Wilson joined a Transport Union protest in Kings Cross for a Press Call. Running out of time – have to search for more Queens – Help!